White corn and shoe peg corn are my favorite. Don’t get me wrong, I like yellow corn, but if I had to choose it’s always the white variety. I have 2-10 ounce packages of frozen thawed shoe peg corn here. I always look for the fresh corn first but if I can’t find it, this is my “go to” when I want to make this dish. I will tell you that if I could have found the fresh, I would have grilled it first to add some of that smokey flavor to the kernels. It’s alright though, I’m going to be adding some delicious ingredients to the corn to make it even better. So now for the other ingredients, I have green, yellow, and red bell peppers, carrots, and some red onion that I’ve diced up into a 1/4 inch dice. On med heat, in a cast iron skillet, I have some unsalted butter along with a little olive oil melting away. Once the butter and oil is ready, next I add in all the colorful veggies. I stir them around for a minute then sprinkle with some Kosher salt, and black pepper. I saute everything for 3-4 minutes just to get some color on the veggies. Next I add in the shoe peg corn. Continue to saute the corn with all the veggies for another 2 minutes, enough to warm the corn through. Then turn off the heat, pour the colorful corn with those veggies into a serving bowl, and add some Chiffonade some fresh basil leaves and stir those through. There you have it, a simple, delicious, and colorful dish. Directions: Note: If using an indoor grill pan to grill the corn first. Get the grill pan nice and hot first, then brush the ears with a little Canola oil first before setting them on the grill. Just a minute or so on all side to get the nice charred grill marks. Next let them cool down a bit before trying to handle them to remove the kernels from the cob. Melt the butter and oil on med heat in a cast iron skillet. Next add in all the veggies with Kosher salt and pepper. Saute for about 3-4 minutes, enough to soften and get some color on the veggies. Add the corn in just to warm through, stirring everything together for another 2 minutes. Turn the heat off, then add in the fresh basil leaves. Pour into serving bowl. 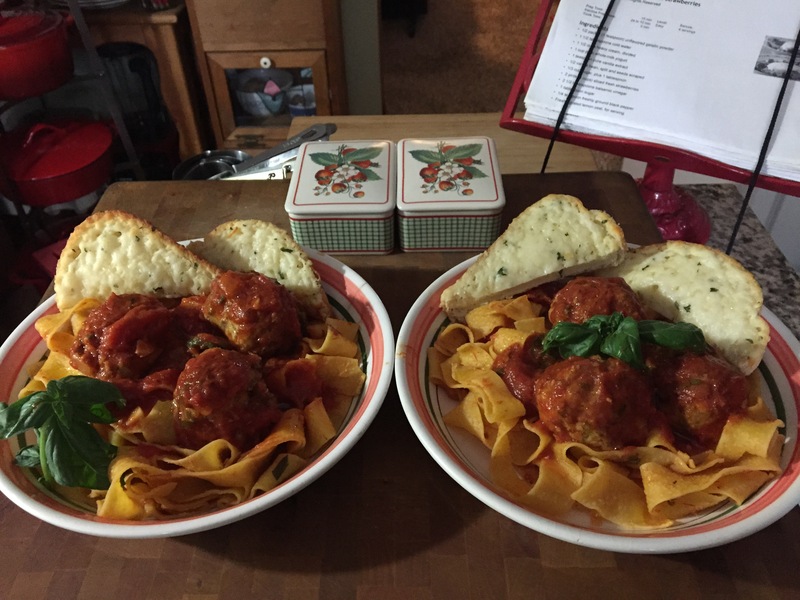 Thanks to my mom and grandmother, I’ve learned so much in the art of making great meatballs. The one important thing that they both told me was not to overwork the meat, when mixing all the ingredients together. Well, keeping that in mind, I went one better. I came to the conclusion, that if you mix all the wet ingredients along with the spices first, then add in the meat, there was less likelihood of over mixing. Let me show you what I mean. First, in a large mixing bowl I add in all the ingredients that will flavor the meat. After it’s been mixed together, I’m looking for it to have the consistency of wet sand as shown in the above picture. I do use a secret ingredient, fresh store-bought basil pesto. In another bowl I have some ground chicken ( it’s a mixture of dark and white meat) and sweet Italian sausage. Add the meat to the flavor mixture. I use a fork to combine all the ingredients. It does take a minute, but it will ensure that no over mixing happens. I used a pound of ground chicken and a pound of sweet Italian sausage for this recipe. Using the large size ice cream scoop, to keep them all the same size,I then rolled out each meatball. This yielded about 22 golf ball size meatballs. On two baking trays lined with parchment paper, that I lightly sprayed some non-stick cooking spray, I lay the meatballs out, with a little room between each one. Lastly before baking them off I sprayed the tops with a little of that non- stick cooking spray to ensure they would brown nicely. While the meatball are baking in the oven, I start on the tomato sauce. In a large pot on med heat I sauteed some diced onions until translucent. To the onions I added in some minced garlic, dried oregano,crushed red pepper flakes, Kosher salt, and black pepper. I stirred that together and then cooked those for a minute more. Add the tomato paste for some of that deep tomato flavor. Stir that until the tomato paste melted in with the onions and garlic. Next, add the low sodium chicken broth. Let that come up to a bubble then I reduced the the heat for a couple of minutes before adding in the tomato product. Next, I add in the brown sugar to balance out the acidity of the tomatoes and let all this come up to a bubble before reducing it to a slow simmer. Bake for 20-25 minutes at 375 degrees F.. Transfer the meatballs to the sauce and let everything simmer together on med-low heat for around 45 minutes. After 45 minutes, start cooking the pasta. I am totally a fan of Pappardelle. The wide ribbons have so much more surface area for the sauce to adhere. I just follow the instructions on the package using the standard salted boiling water. After I’ve drained the pasta really well, I take a cup of freshly grated Parmigiano- Reggiano cheese and place that into the bottom of the bowl. I toss the cheese through the pasta, very gently, so all those ribbons get coated really well. Then I take a couple of ladles full of the tomato sauce and toss that through. what you are witnessing is that the cheese sticks to the pasta, and the sauce sticks to the cheese. Win Win! Finally, I finish with ladling some of the meatballs on top with a bit more sauce, and a little more sprinkling of that cheese. Serve with some crusty cheese bread. Start with making the meatball mixture. Then roll the balls out and lay them out onto 2 parchment paper lined baking sheets that have been sprayed with non- stick cooking spray. Also spray the tops of the meatballs lightly with the spray. Bake them off at 375 degrees F. for 20-25 minutes. While the meatballs are baking off, start on the tomato sauce. Once all the ingredients have been added to the pot, like described above, and the tomato sauce is at a low simmer, remove the meatballs from the oven. Next, transfer the meatballs to the sauce. Let all this cook on a slow simmer for 45 minutes. Next, start the water boiling (don’t forget to salt the water) for the pasta. Drain the pasta really well, have some grated cheese ready in the bottom of a large bowl before adding in the drained pasta. Toss the cheese through the pasta, then ladle in some of the tomato sauce and toss that through. Place some of the lightly coated pasta into a serving bowl, add on a ladle or two of sauce with the meatballs and finally sprinkle with cheese. Serve with some great cheesy bread. Having been in the food industry most of my life, and working with local restaurants, Harvill’s has been the top local produce provider in the Orlando area as far back as I can remember. Located at 8775 S. Orange Ave. Orlando, Florida, they’ve just recently opened a retail market to the public. I visited it today and it’s awesome. I took a few pictures to give you a peek at what’s in store for you. If you live here locally, make Harvill’s produce farmers’ market-retail store a must stop, for all your fruit and vegetable needs. For more information visit their website at www.harvillsproduce.net. Whenever I buy a lean type of protein, like skinless-boneless chicken or boneless pork cutlets, I usually use some type of marinating method to help tenderize the meat. What about smaller portions of meat that may not need that 24-hour brine? For example, center cut boneless pork loin chops. I think marinating smaller cuts like this that are around an inch in thickness are an excellent candidate for #yogurt. Yogurt is naturally acidic and can act as a tenderizer. Other cultures have used yogurt for many years just for this reason. Greek yogurt is thicker with less liquid. and I think it clings to the meat much better than the regular variety. Here I’ve added 1 tablespoon dried oregano, 1 tablespoon garlic powder, 1 tablespoon Kosher salt, and 1 teaspoon freshly cracked black pepper. You could really add any type of dried spices you like depending on the type of flavor profile you’re going for. I stir everything together, combining the spices with the yogurt. Next, I submerge all the pork making sure they are all are completely coated. I cover with plastic wrap and refrigerate for 1 -2 hours. I used a mixture of Panko and Italian seasoned breadcrumbs for this recipe, around 50/50, dipping them into the breadcrumb mixture, shaking off the excess crumbs. Place the breaded cutlets onto a sheet pan and transfer them back into the refrigerator, another 30 minutes. I used Grapeseed oil here, but Canola oil would work fine too. I pan fry them 2 minutes per side, or until they’re lightly browned on each side. Once the pork cutlets have good color on both sides, place them on a wire rack over a foil covered sheet pan. This allows heat to flow evenly around the pork. Next, into a 350-degree F. oven for another 15 minutes. Once you’ve tried marinating this way, you’ll be amazed at how tender and flavorful pork and chicken can be.